The district administration, Customs Department and the Police Department had gone ahead with making all preparations for destroying the thousands of explosives stored in the dry port here without taking permission from the Ministry of Defence. Taking a lesson from the fake mother case, the management of A.S. Modern Senior Secondary School here has directed the parents of the students to submit their photographs to avoid any such incident in future. Come Divali and it is gambling everywhere. Although gambling is not new to Ludhiana, but it crosses all limits on the eve of Divali, a festival associated with the goddess of wealth. “Osteoporosis or weak bones is a major health problem which contributes to over 1.5 million fractures every year in the country. Half of the women above 50 years, sustain an osteoporosis-related fracture sometime in their life. 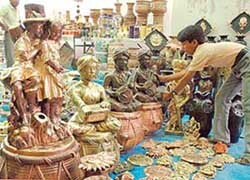 Craftsmen from different regions of the country have brought selected handicrafts from their home towns at the Craft Bazaar, which started on October 13 at Nehru Sidhant Kendra. With election to Cycle and Parts Manufacturers Association to be held today two contesting groups are leaving no opportunity to reach members for support. One group led by the incumbent president, Mr G.L. Pahwa, the other by his opponent, Mr Joginder Kumar, have been trying to meet as many members as possible. The District Fencing Association (DFA), Ludhiana, will organise the Punjab State Junior Fencing Championship for boys as well girls at the Prithipal Singh Indoor Hall of Punjab Agricultural University here on October 22 and 23. This year’s edition will be dedicated to the memory of former Punjab Minister, Joginder Pal Pandey. On a call given by the All-India State Bank of Patiala Employees Federation, employees of the bank held a demonstration in front of their regional office in Millerganj here today. Five labourers were injured when an under-construction roof of a government school collapsed in Seora village in Payal subdivision here today. One injured was admitted to the Civil Hospital, Khanna, while the other four were admitted to the Civil Hospital, Payal. A minor fire broke out at Ansal Plaza building yesterday morning when a generator kept on the roof of the building caught fire allegedly due to some snag that caused sparks. Hundreds of commuters heaved a sigh of relief when the passenger train for Jakhal left on time, 5.40 pm, on Sunday. The sun was about to set in another 10 minutes or so. Everything was well and fine until the train crossed the Sidhwan canal and entered the open rural territory. Complaining of irritation in their eyes, passengers started downing the window shutters to keep the bitter paddy-stubble smoke out. Students of the Guru Nanak Institute of Management and Technology (GNIMT) organised a cultural show to celebrate the success of the institute at the Zonal Youth festival and showcased their performances. A quiz contest was held on the premises of Holly Hock Nursery School here today. Children from various sections of Nursery participated in the quiz and enthusiastically answered questions. The questions were pertaining to the syllabus and some general questions included in the quiz to judge the mental ability of the children. Children of Holly Hock Nursery School at a quiz competition organised on the school premises in Ludhiana on Friday. — Photo by I.V. The three-day academic bonanza of Indian Medical Association, ACADIMA-2005, got under way amidst a galaxy of medical professionals from all over the country and abroad at Silver Oak Resorts here today. Kapil Dev has criticised the Board of Control for Cricket in India (BCCI) for appointing the skipper of the Indian cricket team for a short term. The former captain of the Indian cricket team expressed this view during an interaction with mediapersons here today.